Slight decrease (by 0.4%) of prices of Polish coal sold to power plants in May was rather unnoticeable, as the price expressed in GJ/mt was still above 10 PLN – only for the fifth time since December 2015. With 237.20 PLN/mt it was also almost 10 PLN more than in February and 15% more year on year. Slight increase by 1.1% for energy sector (PSCMI1) and decrease by 0.7% for heat plants and other industrial consumers – in March Polish steam coal prices were rather stable. Rising USD exchange rate made them more competitive towards imported coal. Unlike global trends in Europe and South Africa, in February, Polish steam coal prices kept increasing, as they were since last summer. For the first time since May 2016 PSCMI2 (marker for heat plants and other industrial consumers) was on top of DES ARA prices! Polish coal started the new year with a huge increase in prices, as they constantly were in the recent year, since the end of 2016. For the first time since 2015, the price of coal bought by energy industry broke the psychological barrier of 10 PLN/GJ. In the last month of 2017 Polish coal prices increased again, as they constantly were for the past year, since the end of 2016. In Q4 price of coal sold to power plants was more than 10 PLN higher than in the Q1, and when it comes to coal sold to heat plants and other industrial consumers – more than 30 PLN. New report on recent coal shortage in Poland – now available for our readers (so far onlyin Polish). Production problems underground, legal limitations, consumers review (energy sector, heat plants, retail customers) and our forecasts. Thanks to Industrial Development Agency (ARP) we know now what were the prices of mid- and large sized coal (all peas, nuts and stoves and coal with grain larger than 31,5 mm) in first three quarters of 2016. Naturally, retail customers were the main purchase group of that commodity. December update on Polish coal prices: PSCMI1 (coal sold to the energy sector) and PSCMI2 (heating sector and other major industrial consumers) and markers delivered by globalCOAL. PSCMI1 increased by 0,52% and PSCMI2 by 2,32% MOM. Mainly because of increasing coal prices on international markets in second half of the year and fixed low prices of Polish coal, in 2016 Baltic ports in Gdansk, Gdynia, Szczecin and Swinoujscie recorded lower handling of this commodity. In 2016 Polish coal mining industry produced 70.4m Mt of hard coal, which means the total production went down by 1.8m Mt YOY. Meanwhile sales went up by 2,7m Mt YOY and in total reached the level of 73.1m Mt. Fresh update on Polish coal prices: PSCMI1 (coal sold to the energy sector) and PSCMI2 (heating sector and other major industrial consumers) and markers delivered by globalCOAL. Polish coal indices are following last month’s trend. In first 3Q Poland imported 5.9m Mt of hard coal, which is 200k more YOY. Last year domestic import recorded 8.2m Mt, which was 2.1m less than in 2015. According to Industrial Development Agency (ARP), in current year that amount should be similar. So far, in after 9 months of 2016 Poland imported 4.3m Mt of steam coal (mainly from Russia) and 1.6m Mt of coking coal (Australia). With price bellow 50 USD/Mt, we have even bigger spread between international coal indices and Polish PSCMI1 (coal sold to the energy sector). PSCMI2 (heating sector and other major industrial consumers) is trying to keep up with ARA, RB and NEWC and recorded small increase up to 52,03 USD/Mt. In October, Polish coal mining sector produced in total 6.3m Mt of hard coal, which was 100k more MOM and 500k less YOY. In the same month, industry sold 6.5m Mt of commodity, which was almost 2m less MOM and 1.5m less YOY. Piles of unsold coal shrunk to only 3m Mt. Still going their own ways, PSCMI1 marker decreased in October (-3.4% MOM), despite the fact that international coal prices were going up and recorded 189,71 PLN/Mt. Small increase in PSCMI2 by 1.71%, which gives 202,90 PLN/Mt. After first 9 months of 2016 Polish coal mining sector had 1.3bn PLN loss on coal sales: each ton was sold with 10 PLN loss. Since January the whole industry produced 52m tons, with 42m Mt of steam coal and 9.7m Mt of coking coal and sold 54m Mt (3% more YOY). Unsold coal stocked on piles shrunken in September to 3.4m Mt (from 5.7m Mt in August) and employment in the sector stabilized at a level of 86.8k miners. Meanwhile, both production and sales recorded in that month highest level in 2016. September update on International weekly coal price indices: Atlantic/European DES ARA, South African FOB RB and Pacific/Australian FOB NEWC. No surprise here: further increase of all three markers week by week. Breaking point on the Polish coal inner trade market? Finally, after 5 months of going their own ways, PSCMI markers started timidly increasing: PSCMI1 by 4.4% MOM (197.09 PLN/Mt) and PSCMI2 by 3.9% MOM (199,50 PLN/Mt). After recent reconstruction of Beata Szydlo’s government in finance department, now the wind of change is coming to the Ministry of Energy, so far very unofficial. Rumors says, that around Saint Barbara’s Day we can have switch on the big chair and in the coal mining area. Paraphrased Polish proverb, which means the same as English “to kill two birds with one stone” is a good metaphor of what was done last year with Kompania Weglowa, which at an edge of bankruptcy managed to sell in advance coal for 727m PLN. With increasing coal prices on international markets, entities which took part in it could feel like winners. In August hard coal production in Poland exceeded sales by 270k Mt. Unsold coal was moved to piles, which are rising again – at the moment they were counted for 5.7m Mt. In total, coal production in August was higher by 250k Mt YOY, but sales was lower by 350k Mt YOY. Since April, Polish coal prices tends to go their own separate way. While international coal indices ARA, RB and NEWC go sky high, PSCMI markers keep decreasing slowly: PSCMI1 by 3.75% MOM (188.78 PLN/Mt) and PSCMI2 by 1.21% MOM (192,05 PLN/Mt). August update on International weekly coal price indices: Atlantic/European DES ARA, South African FOB RB and Pacific/Australian FOB NEWC. Further increase of all three markers (DES ARA by 5.6%, FOB RB by 6.6% and FOB NEWC by 10%) with slight drop in the last week of the month. LWB: SAME PRODUCTION, MUCH LOWER SALES? Bogdanka’s CEO Krzysztof Szlaga declares, that in the following years the mine will keep the steam coal production at a current level of 8-9m Mt. Until now Bogdanka was using the geographical advantage over Silesian producer in sales to Enea’s Kozienice power plant and Energa’s Ostroleka. Until now. For some time now Ministry of Energy is trying to find a solution to decrease Russian coal export to Poland. As the duty tax is not an option, ME is now looking for some more sophisticated methods to stop the Russians and play along with EU environmental policies. Not only international coal prices are rising, but in the wake of them also stock value of Polish hard coal producers listed on Warsaw Stock Exchange: Jastrzebska Spolka Weglowa and Lubelski Wegiel Bogdanka. Quick look on the WSE listing in last 3 months. In second quarter 2016 not only price decreased MOM, but also volume of traded coal (6,403k Mt), which was lowest since Q2 2013. Also quality of the coal went down: calorific value of steam coal traded in Q2 2016 was 21.17 GJ/Mt – lowest result since Q4 2013. Polish coal price markers for a year now tends to go their own way, regardless to where international indices tends to go. In July we’ve observed dynamic growth of DES ARA, RB and NEWC markers, but PSCMI1 and PSCMI2 haven’t changed much. Last week we’ve reported that international indices increased respectively by 7.2%, 10.8% and 14.1% MOM. Meanwhile, Polish prices raised only by 1.34% and 1.83% MOM. International coal prices not only tend to increase in following months, but also the tempo is bigger and bigger each month. In July, rise in coal indices for DES ARA, RB and NEWC was respectively: 7.2%, 10.8% and 14.1% MOM. Lublin Coal Basin-based producer recorded 75m PLN net profit in first six months of 2016, which is only 500k PLN less than in the same period last year. Income (849m PLN) was 5m PLN more than in H1 2015. The results met with expectations. First of many weekely comments from Polishcoaldaily Editor exclusively for Trybuna Gornicza, in a new column called “Point of view”. Topic no. 1 – elaborated version of our former report CHEAP COAL? PRICEY COAL? – IT’S BAD EITHER WAY. Articles available for Polish speaking readers only. Latest update of CIF ARA and FOB RB international coal price markers. After whole week of recording above-60 USD/Mt results, on friday index for coal imported to Western European ports again fell slightly bellow the line and now shows 59.91 USD/Mt. 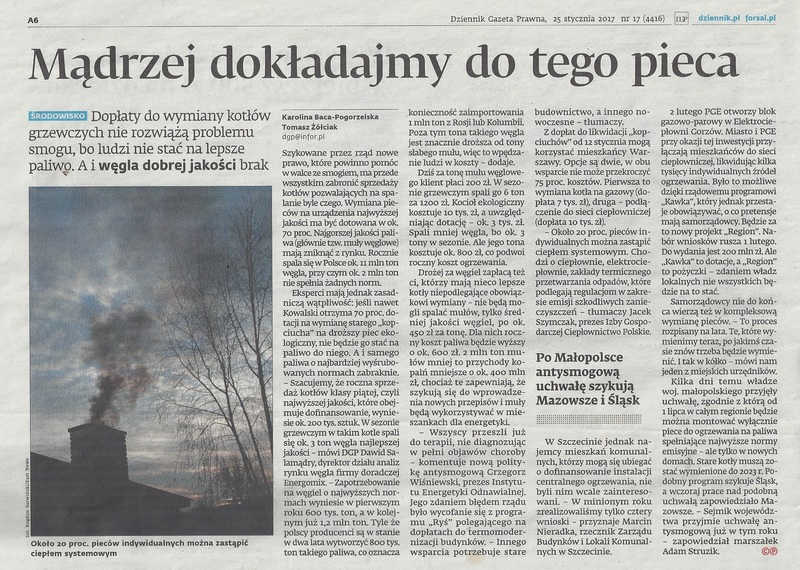 Last week’s comment from Polishcoaldaily Editor for Trybuna Gornicza on current situation in Jastrzebska Spolka Weglowa. Find out what recently happened and what may the next few months bring to the largest coking coal producer in Poland. The whole Polish coal industry is complaining for quite some time now on low coal prices and literally praying for some bounce off, which with the high production costs would allow them to record better results of unit sales. There it came, since April the prices are rising, but in the long term – will this trend be a salvation or doom for the coal producers? Polishcoaldaily Editor talked on Wednesday in Polskie Radio 24 on the subject of EU Commission decision towards restructure plan for Polska Grupa Gornicza (KW) and Polski Holding Weglowy (KHW). Polish readers only. Latest comment from Polishcoaldaily Editor for the Centre of Analysis of the Jagiellonian Club on the subject of rescue plan for Kompania Weglowa and Katowicki Holding Weglowy. Will Polska Grupa Gornicza and Polski Holding Weglowy have to give back all the public aid that they received? Half a million tons of unsold coal was moved to the piles in June, which was the worst month of all 2016 when it comes for sales. Naturally, it could be justified by the end of heating season and decreased demand. After first six months of current year, coal stocked on piles accounted for 5.2m Mt. Luckily for the coal producers, most of it is already sold with prepayments. For the first time on our charts, both Polish coal price markers went bellow all three lines indicating international prices on ARA, Richard’s Bay and Australian Newcastle. While DES ARA, FOB RB and FOB NEWC indices keep increasing consistently since the beginning of 2nd quarter, PSCMI1 and PSCMI2 keep the opposite trend.